Illamasqua’s summer sale on its UK website has been going on for a few weeks, and actually I’m not surprised it’s still on. There isn’t much good stuff. It’s the last week of the sale though, so if you haven’t already, go check it out. There is free international shipping for a minimum purchase of £50. For myself, I got the cream pigment in ‘Androgen’ and the cream blusher in ‘Seduce’, mostly to quiet that inner voice telling me it is a good deal. Surprisingly given the height of postal traffic nearing Eid, my order arrived very quickly. This review is for Androgen. 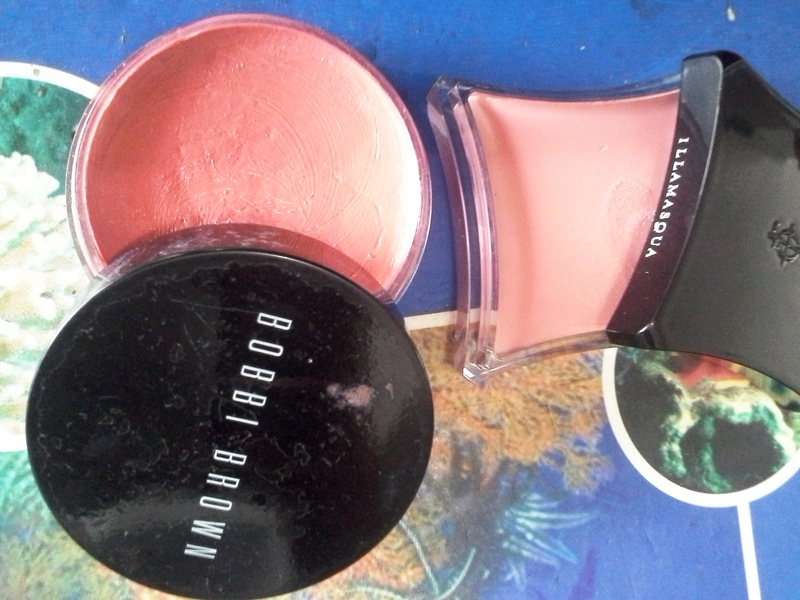 Below is a comparison with Bobbi Brown Pot Rouge ‘Calypso Coral’ (an old version when it was still in the pot). 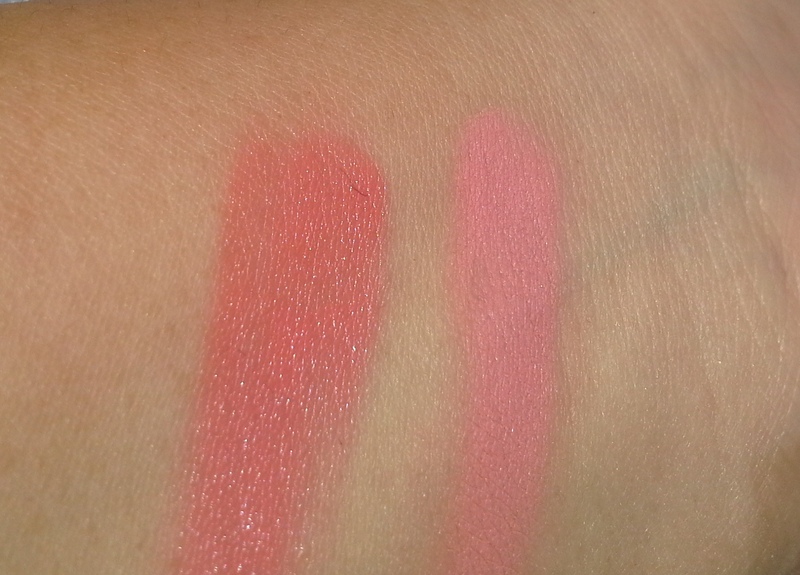 Obviously they are quite different, with Calypso Coral being redder and with a dewy finish. Incidentally, my Calypso Coral is probably more than four years old, and it’s holding up quite well. I don’t use it often, but periodically I wipe off the top layer and drench it in alcohol for a few seconds. i do this randomly to all my cream blushes and old(er) lipsticks, to extend their life a bit. The ideal solution, of course, is to have a dedicated makeup fridge. Androgen is quite a lovely orange-y coral. It is solid to the touch, creamy upon swipe of a finger, easily blended and dries quite matte. 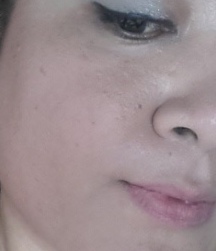 Its lasting power on my oily skin is quite good with primer. I also quite like it on the lips; there is a mod feel to the color. Androgen is also lovely layered under gloss. I haven’t tried it on the eyelids, but I think this would be a good base for peach, lighter browns, and orange eyeshadows. Will need to try that soon. When I bought it, Androgen was priced at £10. Now it’s down to £7.50. For such a fun and versatile product, I think it’s one of the best values you can find in Illamasqua’s current summer sale. The betting world is bonkers over the new Prince’s name. Seems that George is holding top ranks. 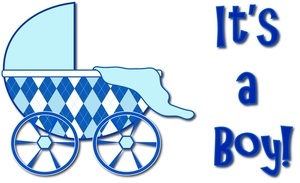 I’m not putting money on it, but I think it’s a good one. ‘Phillip’ will probably feature in there somewhere, as well as Charles. Seperti kuku, rambut yang sudah ada di atas kulit, adalah sel mati. Mati. Killed. Dead. Apakah benda mati bernapas? Makan? Minum? Ikut lomba lempar lembing?? Bila demikian, apakah berarti tidak ada gunanya dan tidak perlu perawatan? Tentu tidak. Tapi salah kaprah kalau perawatannya untuk memberi nutrisi, membiarkan bernapas, etc. Memangnya dukun, mau membangkitkan benda mati? Plus kalau memang mau dibangkitkan ya mbok yang lain gitu, yg lebih berharga dan menarik misal err…..
Jadi bagaimana perawatannya? Ya tentu apa tujuan yang dikehendaki? I’m a nail polish addict, so my nails are the canvas I need to show off the polish. Jadi harus kuat, keras, dan permukaannya smooth. Kuat dan keras berarti pori2nya harus diisi. Pakai apa, ya macam-macam, perlu eksperimen. Karena contohnya nih, sponge mandi kan berpori-pori sehingga bisa menyerap …sesuatu. Untuk melakukan … sesuatu. Bisa menyerap air, minuman anggur, darah, dll. Kalo tujuan untuk lap jendela, yang mboros banget kalo diisi Sangria kan. Kecuali memang Sangria anti kotor dan kaca bisa bersih berminggu-minggu, boleh deh dilakukan. Or unless you have so much money you don’t know what to do with it. So it’s a waste to shower nails and hair with nutrients, etc, because they’re dead. Killed. Nutrisi itu diperlukan sebelum rambut atau kuku keluar dari permukaan kulit (killed!). But that’s for another blog post. The title of the post is a generic one provided by WordPress, but it’s fitting so I will keep it. I’ve been writing beauty and travel reviews elsewhere, but recently thought I’d be nice to have my own. There is already a slew of great beauty and nail blogs, many of which I’ve been regularly reading for the past few years (look for blogroll in the sidebar soon). So why another? Well, for one I think there is still a niche for an Asian perspective: a humid and hot clime is the true testing ground of good cosmetics. I also do good amount of travel, often on the not so beaten path and based on experience, there is not enough info in English for this part of the region. Finally, I’m a researcher in my other life, so i look at jargons with a critical mind, and attack hype with zeal. Rouge G de Guerlain: the new case fits the old! Product Review: Feet Exfoliation that Really Works! Dawn on Review and Swatches: Urban Decay Naked3 is a Plum Purple Palette!